There are so many beautiful places to hike in Bryce Canyon and the surrounding areas, and even shorter hikes for those who are looking for a relaxing stroll rather than take on some of the more strenuous and challenging hikes. That is one of the great things about the Bryce area, there is definitely a hike for everyone! Here are some of our favorite short hikes to take. This is quite a unique hike, the voodoos here are even more odd than usual. The name was given due to the fact that the voodoos here are wider on top making them look like hats atop their spires. This is a 3.7 mile round trip, unmarked trail that is located on a steep slope about 1.85 miles from Bryce Point and is apart of a larger set of trail systems call 'Under the rim'. Bryce Canyon has such a different landscape from the other National Parks. From hoodoos and arches to natural bridges, Bryce Canyon has it all. Tower Bridges a natural bridge between two sky-scraping hoodoos, and is a little less of a "stroll" but is one of the shorter hikes in Bryce Canyon. This hike is a 3 mile roundtrip, starting a sunrise point and giving the hiker a choice of returning back to sunrise point or to keep going to fairyland loop, which makes the hike 8 miles roundtrip. 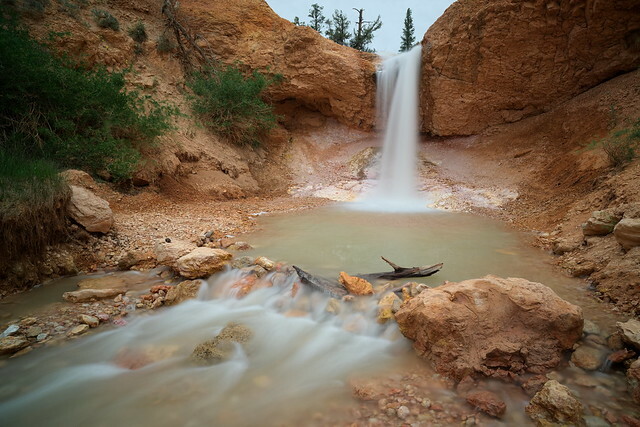 This has quickly grown in popularity the last few years, as it is one of the coolest and prettiest hikes in Bryce. The trail is short and sweet and leads to this absolutely stunning waterfall and stream that you can swim in or eat your lunch by. Located about 4 miles east of the intersections of Highway 12 and 63. This is a very family friendly easy hike to take. This is hike is located in Kodachrome basin. It is only a half mile trail that leads to an arch with an amazing panoramic view of Kodachrome Basin. Located in Kodachrome basin, this is a short half mile loop that is handicap accessible and has signs that highlight the flora and fauna. This is a really good family trail for ones looking to just take a quick walk to get to know the area a little better.